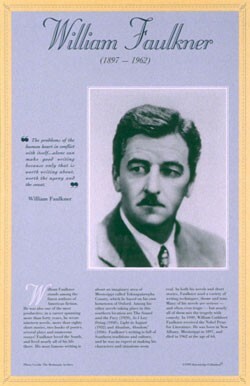 This unique educational poster of author William Faulkner features a striking photo of him, as well as a quote from the author about writing, and concise biographical text summarizing his life and career. 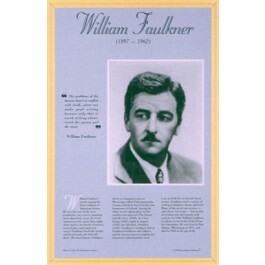 William Faulkner is considered one of the greatest authors of American fiction, known for such works as "The Sound and the Fury," and "As I Lay Dying." He loved the South and much of his writing takes place there. In 1949, he received the Nobel Prize for Literature. This poster is a great way to introduce students to this great 20th century American author.